This is the first of a series of posts I’m planning for this blog that focus on scientists that paved the way for the current research in soil science, wetland science, and soil and water conservation. Hugh Hammond Bennett is a proud son of the state of North Carolina. 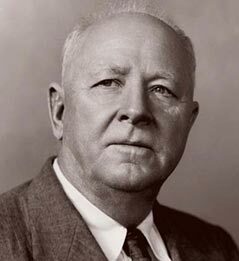 Hugh Hammond Bennett was born on April 15, 1881, in Anson County, North Carolina where he grew up on his father’s 1,200-acre plantation in the Carolinas (Cook, 2012). He later received a degree in chemistry from the University of North Carolina at Chapel Hill (I think if he was around today he would have enrolled in soil science at NC State, but maybe I’m biased). His intentions were to follow a career in pharmacy, but instead fell into a position with the USDA as a chemist with the Bureau of Soils, and eventually started with the soil survey. Through his experience in the soil survey, Bennett realized the effects of soil erosion and the negative impacts it had on agriculture. This lead him to eventually publishing Soil Erosion, A National Menace which, through Bennetts political connections, eventually lead to some federal funding approved for erosion research. This funding Bennett established a network of ten erosion stations in various problem areas of the country: Clarinda, Iowa; Hayes, Kansas; Bethany, Missouri; Statesville, North Carolina; Zanesville, Ohio; Guthrie, Oklahoma; Temple, Texas; Tyler, Texas; Pullman, Washington; and La Crosse, Wisconsin. Through the affirmative data found at these research sites, Cook states there were finally “positive tangible results of [Bennett’s] efforts to arouse the American public to act. The soil erosion peril was, for the first time in the nation’s history, an official concern. This was occurring during the great depression, and right before the peak of the dust bowls in the southern Great Plains. As part of President Roosevelt’s New Deal, the Civilian Conservation Corps was established. With that, the Soil Erosion Service was also created within the US Department of the Interior with Bennett in charge to lead the fight for soil conservation. Cook states that “The CCC was established ‘to carry out reforestation and other conservation projects in the national forests and national parks.’ A five-million-dollar appropriation was made available for erosion control on private and public lands, with work to be administered by the Bureau of Agricultural Engineering in the USDA.” At the request of the secretary of agriculture, the Soil Erosion Service was later moved from the Department of the Interior to the Department of Agriculture. Shortly thereafter, the Soil Conservation Act was passed by congress without a dissenting vote and signed by congress on April 27, 1935. The act established the Soil Conservation Service (now the Natural Resources Conservation Service), as a permanent department of the USDA. The departments first chief – Hugh Hammond Bennett. Bennett was crucial in the development of science studying soil conservation. He was also vital to the implementation of conservation practices, and the development of local soil and water conservation districts. He was also a founding member of the Soil and Water Conservation Society. Hugh Bennett officially concluded his career of distinguished public service on April 30, 1952, when he retired from the SCS. He died on July 7, 1960, after a long battle with cancer. This entry was posted in Erosion, Shoulders of Giants and tagged Dust Bowl, Erosion, Hugh Hammond Bennett, NRCS, Soil and Water Conservation Society, Soil Conservation Service, Soil Erosion Service. Bookmark the permalink.